HAPPY BIRTHDAY to ME! Happy Birthday to Meeeeeeee, Happy Birthday, Dear Me-e-e-e, Happy Birthday TO ME! Why, YES, it IS my birthday today! How did you know?? 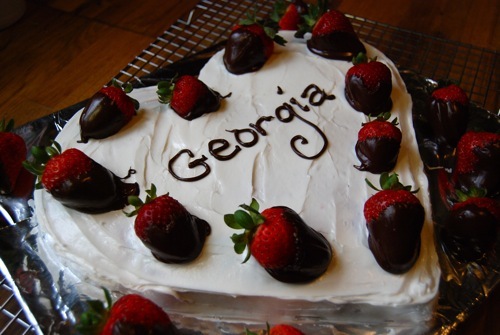 This cake is beautiful. It is delicious. It is easy to make. It is every thing you want for you and your loved one, wrapped up in one simple recipe. So look no further. Get out those pans, preheat that oven, and get ready for the party. 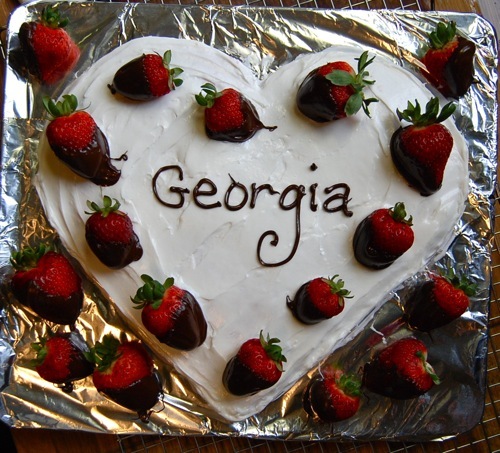 NOTE: This recipe can be made as follows (yielding one large heart shaped cake), or can be baked in 2- 8-inch round pans for a layer cake, 1- 9×13-inch sheet pan, 2- 9-inch square pans, or 24 standard size cupcakes. Baking time will need to be adjusted accordingly. Recipe adapted from Bake and Make Amazing Cakes (Kids Can Do It). Preheat oven to 350 degrees. Get out 1- 8-inch round cake pan and 1- 8-inch square cake pan. Grease and flour both pans and set aside. Using a mixer, cream the sugar and butter in a large bowl. Add the eggs and vanilla and blend well. Sift together the flour and baking powder in another bowl. Add the flour mixture to the wet batter, about 1/3 at a time, alternating with the milk. Repeat until everything has been added, mixing well. Pour the batter into the prepared baking pans. Place on middle rack in oven and bake 30-40 minutes, or until tester inserted into the center of cake comes clean. Remove pans from oven and place on wire rack to cool. Cool fully before carefully running a knife around edges, inverting pans and gently removing cakes. Before assembling, prepare a base for the cake. I used a large baking sheet covered in aluminum foil. 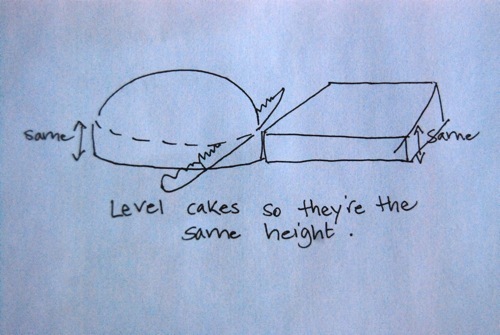 If necessary, level the two cakes so they are roughly equal in height (as shown below). 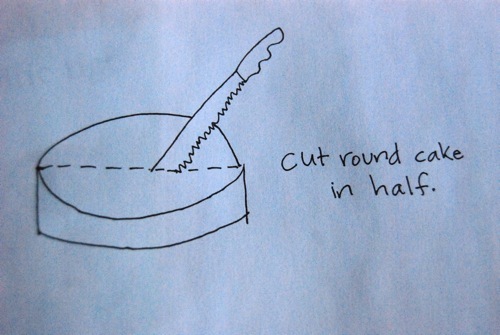 Carefully cut the round cake in half. Then assemble the three pieces to form the heart shape. 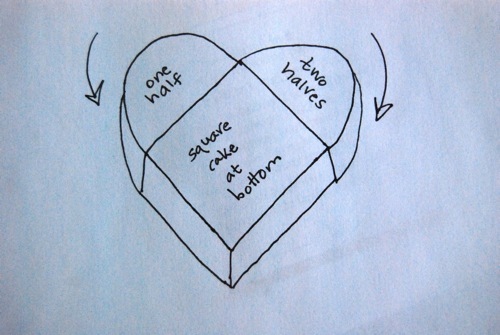 Place the square cake at the bottom – diamond style – then align the cut halves at the top to complete the heart. Set the cooled heart aside and prepare the frosting. Sift the powdered sugar into a large bowl. Add the butter, and cream together using an electric mixer. Add the milk and vanilla, and beat until smooth. To tint the frosting, add 3 drops of food coloring at a time, beating and adding more food coloring as necessary. 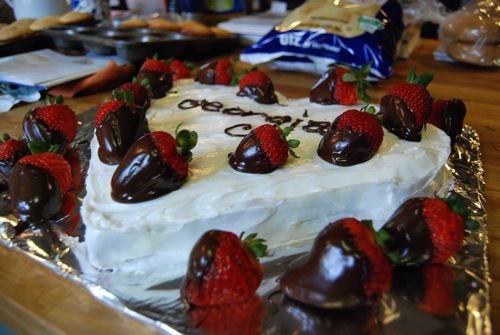 Spread frosting gently on top and sides of cake, then decorate as desired. HAPPY BIRTHDAY! My sister-in-law has Ménière’s disease and I would like to make her chocolate cupcakes for her birthday. I have low sodium baking powder but not baking soda. I was wondering if I can make this into a chocolate cake by substituting some of the flour for cocoa powder. Hi April! My sincere apologies for getting this sooooooo late. Really hope your sister had a marvelous birthday! Yes, you can definitely swap some of the flour out and add cocoa instead. I’d start with 1/4 cup to 1/3 cup and work from there. The low-so baking powder is all that you will need still. Best of luck & again my apologies for the delay! I know this post is from along time ago – but for anyone with Ménière’s you need to consider that the caffeine from chocolate is a potential trigger. The safest bet is to go with the original recipe. The middle of my cake won’t cook. It has been on gas mark 4 for almost 55 minutes. Please get back as soon as possible. Well, as this is….. um….a good 2 months later, I’m very sorry it won’t be helpful! My only advice in future would be to place an oven-safe thermometer in your oven to test the temperature. Our old stove was terrible at keeping the heat. Sounds like something is up with yours too. The cake will definitely bake in the time allotted in the recipe. Have you tried substituting pumpkin puree or all natural applesauce for the butter or eggs? When I tried making the frosting, the 4 cups of powdered sugar that I tried to mix with the 1/2 cup (1 stick) butter doesn’t work! The butter disappeared and the powdered sugar flew everywhere. It wouldn’t blend together. I never made frosting like this before. What am I doing wrong? I made this birthday cake this past weekend for my husband and family. Rave reviews!!! I would definitely make this again. I would follow suggestion of earlier post about the frosting – cream butter first, little bit of milk and vanilla then gradually add some sugar and alternate with rest of milk a little at a time. The frosting was simple and delicious. Yayyyy! Great to hear, Chris. So glad you enjoyed it! Wondering about the type of flour. Is this all-purpose, self-rising, cake flour, or something else? My granddaughter has a rare kidney disease and has to have low sodium. Her birthday is late February and I would love to try this cake for her. Please let me hear from you soon. Thanks! I’d recommend using standard all-purpose flour, or cake flour for an even finer crumb. Avoid self-rising flour because it’s much higher in sodium. Really hope your granddaughter enjoys it! And you, too!